Jenny Sabin Studio has been named as the winner of the MoMA PS1 2017 Young Architects Program (YAP) with her project called "Lumen". 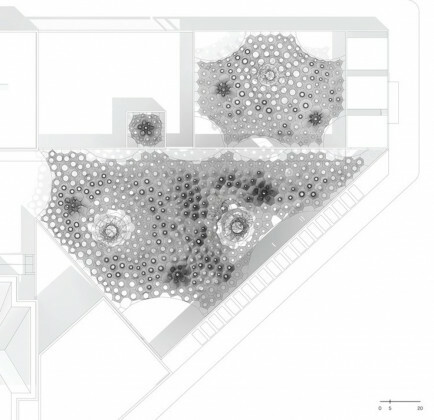 The project is a socially and environmentally responsive structure that adapts to the densities of bodies, heat, and sunlight. 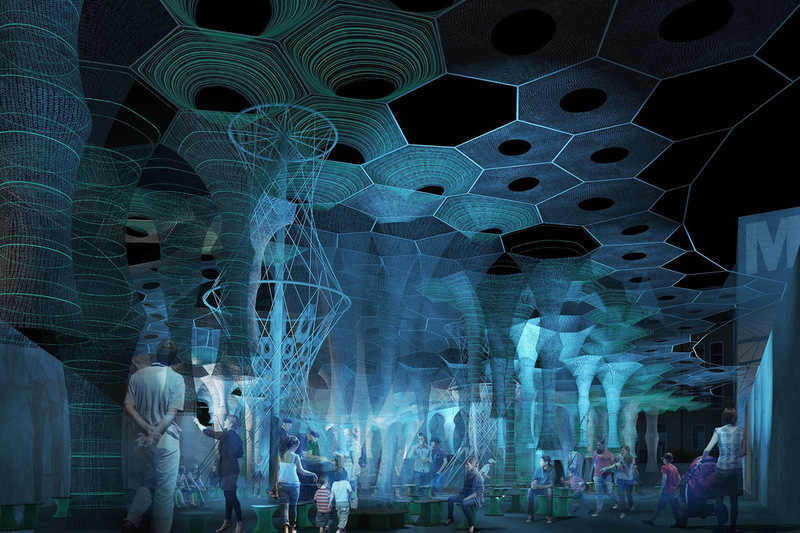 By night, Lumen is knitted light, bathing visitors in a responsive glow of photo-luminescence; by day, Lumen offers succor from the summer heat, immersing participants in delicious ground clouds of cooling mist. A lightweight knitted fabric of responsive tubular structures and a canopy of cellular components employs recycled textiles, photo-luminescent and solar active yarns that absorb, collect, and deliver light. 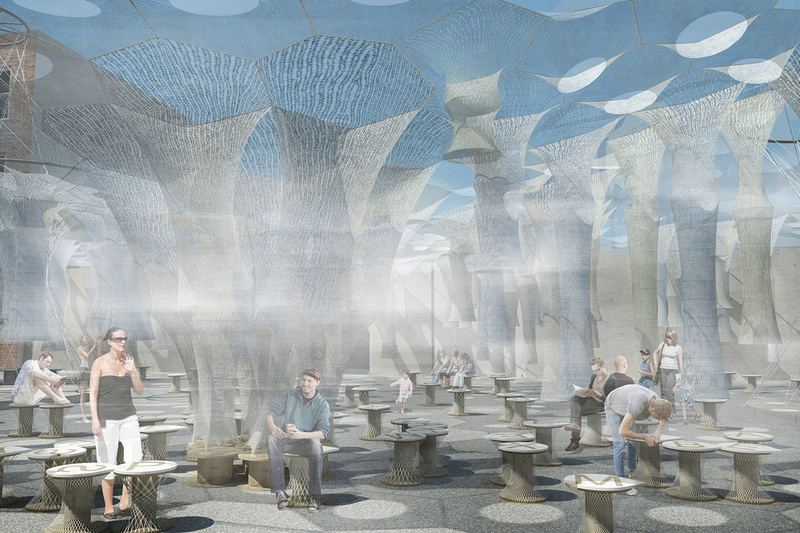 This environment offers spaces of respite, exchange, and engagement as a misting system responds to visitors’ proximity, activating fabric stalactites that produce a refreshing micro-climate. Families of robotically woven recycled spool chairs reveal informal messages and conversations through hydro-chromic materials. It is an open responsive system featuring digitally knitted and robotically woven lightweight, high-performing, formfitting, and adaptive materials. Lumen is a feminine form that offers luminous interiorities, informal networks, social fabrics, and fibrous assemblages that are pliable, transformative, and playful. 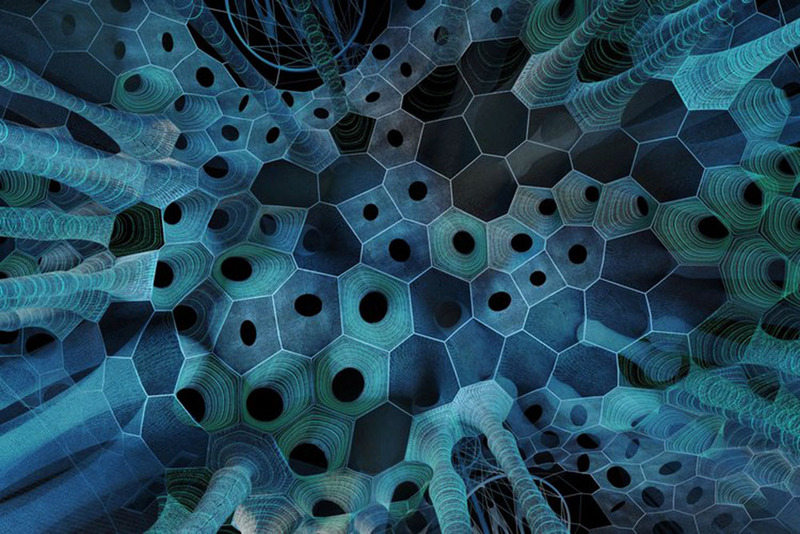 Lumen is an experiment, taking risks through collaboration across disciplines. 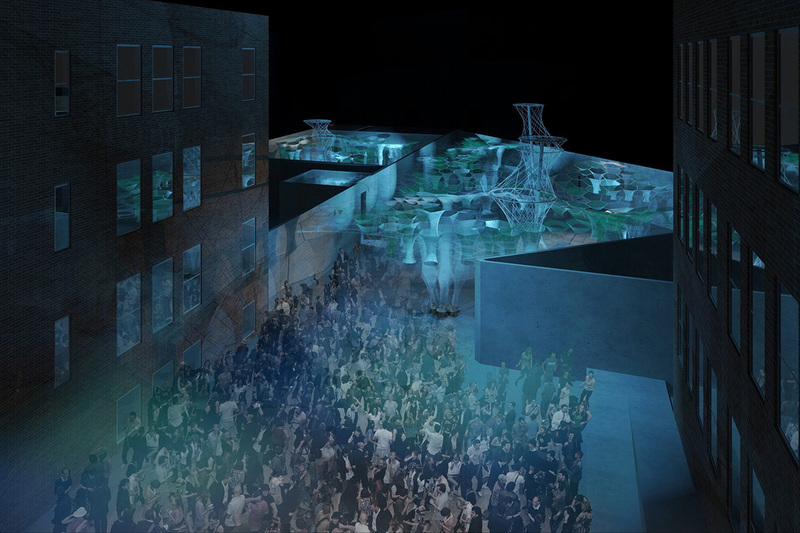 Held in tension within the PS1 courtyard matrix of walls, Lumen applies insights and theories from biology, materials science, mathematics, and engineering. Material responses to sunlight as well as physical participation are integral parts of our exploratory approach to new materials, embodiment, and a transformative, adaptive architecture. 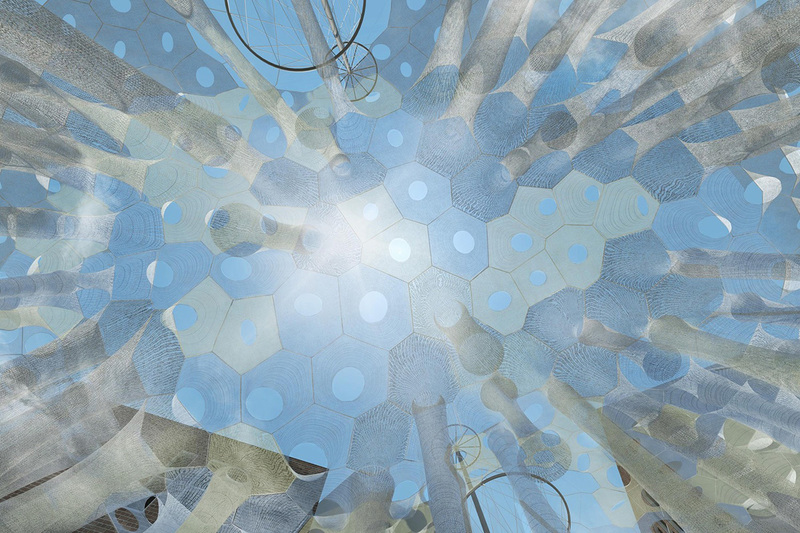 The project is mathematically generated through form-finding simulations informed by the sun, site, materials, program, and the structural morphology of knitted cellular components. Resisting a biomimetic approach, Lumen employs an analogic design process where complex material behavior and processes are integrated with personal engagement and diverse programs. 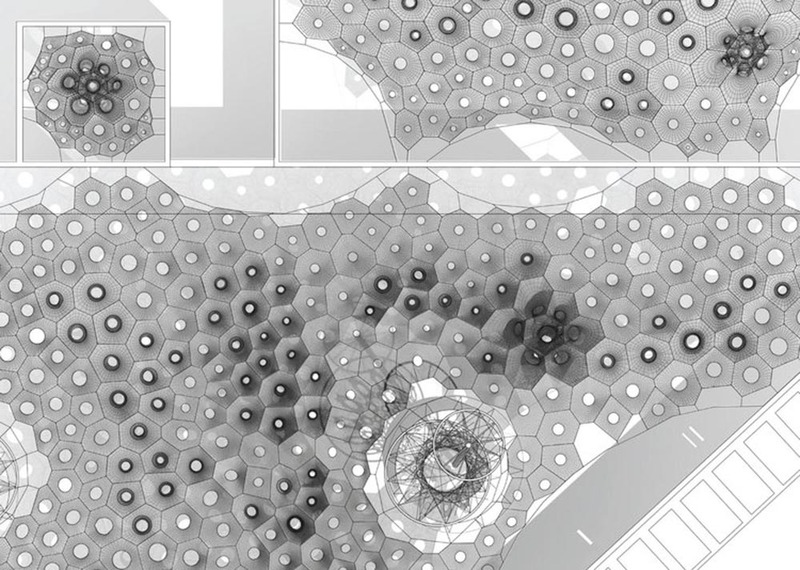 Through direct references to the flexibility and sensitivity of the human body, Lumen integrates adaptive materials and architecture where code, pattern, human interaction, environment, geometry and matter operate together as a conceptual design space. Knitting and textile fabrication offer a fruitful material ground for exploring these nonstandard fibrous potentials. As with cell networks, materials find their own form where the flow of tension forces through both geometry and matter serve as active design parameters. Lumen undertakes rigorous interdisciplinary experimentation to produce a multisensory environment that is full of delight, inspiring collective levity, play, and interaction as the structure and materials transform throughout the day and night.